Taucht ein in ein Paradies aus goldfarbenen Sandstränden, kristallklarem Wasser und tropischem Regenwald. 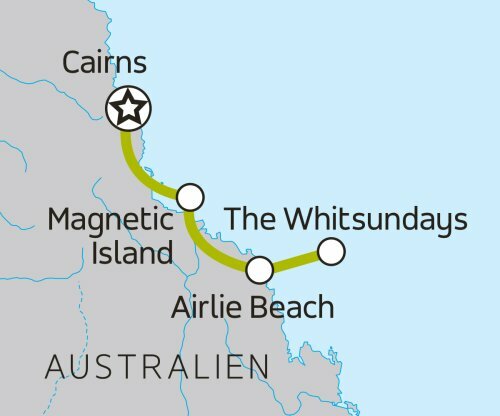 Diese Tour führt Euch an die Ostküste Australiens, von Cairns zu den traumhaften Whitsunday Inseln. Zu Beginn könnt ihr euch von den Freizeitaktivitäten und dem Nachtleben von Cairns begeistern lassen. Danach entdeckt ihr auf einem Segeltörn die unvergleichliche Schönheit der Whitsunday Islands, ein Schatz, reich an malerischen Orten, atemberaubenden Landschaften und aufregenden Aktivitäten. Egal ob ihr in den Korallenriffen schnorcheln geht oder die makellose Schönheit der Inseln und die weiße Pracht von Whitehaven Beach genießt, diese Segeltour und der Aufenthalt auf einer tropischen Insel sind ein Highlight der Tour! Gegen Aufpreis ist die Unterbringung in Einzel- oder Doppelzimmern möglich. Aufpreise bitte bei uns anfragen. Bitte beachtet, dass sich die angegebenen Preise/Hotels jederzeit unangekündigt ändern können. Just like a double-shot macchiato in the morning, two days in Cairns will get your heart started. Meet and greet the crew this morning, and get acquainted with some of Cairns’ hotspots. This afternoon is free for your to check out some of Cairns’ best optional adventure activities: bungy jumping, skydiving and whitewater rafting. Like the thought of spending a whole day exploring the only place in the world nestled between two World Heritage areas? Go on then. Take an optional day trip up to the Daintree Rainforest or join us on our most popular day trip to the Great Barrier Reef (and take home that elusive selfie with a photobombing fish). Please note: Pre-book your Great Barrier Reef day trip at the time of booking to secure your spot. Hard as it will be to leave, our time in Cairns has come to an end. 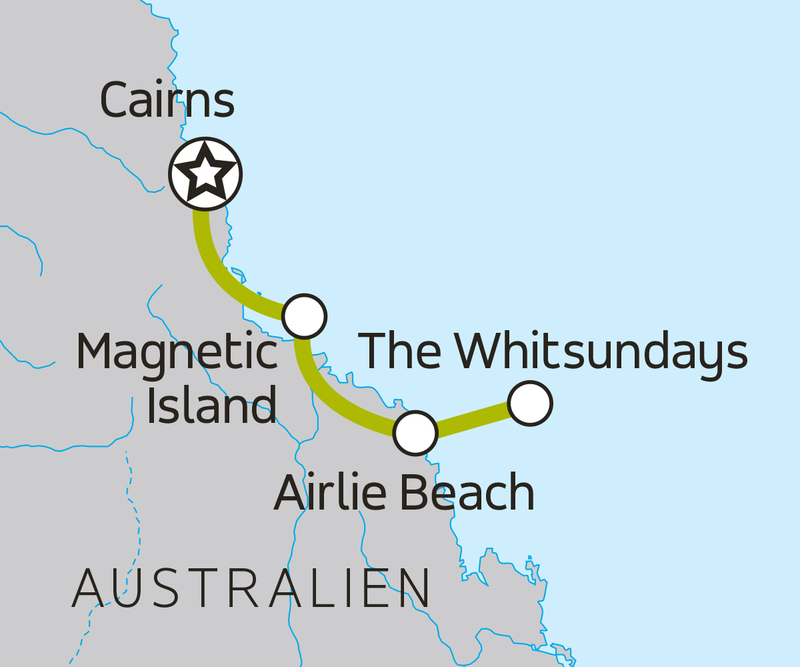 Today we head south to explore the natural and wildlife wonders of Magnetic Island. Keep your eyes peeled for the rare and endangered cassowary bird on our morning drive, and then it’s a quick ferry trip before you have the afternoon to explore this amazing piece of paradise. Discover secluded beaches and national park walking trails, or just laze by the pool with a cocktail. We won’t judge. Get stuck into a private tour of the local wildlife park, where you can kiss a baby crocodile, smooch a blue tongue lizard and even cuddle a koala (all optional). Then,Leave the bus and board your own private yacht for our overnight sailing trip in the beautiful Whitsunday Islands. Normally a toy for the rich and famous, today the yacht is all yours to learn the ropes while sailing in paradise. More of a land-lover? Take the diva option and let the crew do the work whilst you feast, swim and snorkel. Please note: We ask that you pack a small overnight bag to take onboard with you as space on the overnight sailing is limited. Pack items like swimmers, beach towel, chargers, hat, sunscreen, camera, jacket, toiletries, sandals/flip flops and casual clothes for two days. Wake up to pure paradise in one of the many sheltered coves that make up the Whitsundays. Today we’ll set sail for golden sandy beaches, snorkel over coral reefs and soak up the sun. A visit to the famous blinding white sands of Whitehaven Beach and Blue Pearl Bay will also be an option if the weather behaves (fingers crossed!). If you’re a budding captain, you can even help set the sails and take the helm whilst further exploring the islands. Later this afternoon, set a course for our return to land where we’ll spend the night in Airlie Beach. Read: pool, shower, dinner, dancing – all in that order! After breakfast, we say goodbye to the Whitsundays and your trip buddies…but there’s plenty more adventure left in Oz. Why not plan another trip? Die Fahrzeuge haben nur ein begrenztes Platzangebot. Ihr solltet euer Gepäck daher auf maximal 20 kg beschränken. Diese Reise ist Bestandteil einer längeren Tour, daher reist man zusammen mit Teilnehmern, welche die Reise schon früher begonnen haben bzw. diese im Anschluss an diese Tour noch weiter fortsetzen.